Bibliothèque Montcalm Library is a municipal library located at 113 2nd Avenue in École régionale Saint-Jean-Baptiste. 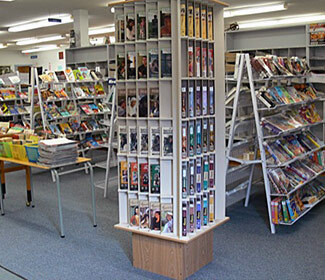 There is a wide range of reading materials and DVDs available for all ages in both French and English. There are 10 computers available to our clients with access to high speed Internet, a variety of computer programs and a scanner. A projector and screen can be rented for $10.00 per day. Photocopies are $0.20 per copy. A laminator, shredder and a binding machine are available to the public for a minimal fee. The RM of Montcalm and the South Central Regional Library (SCRL) have a reciprocal borrowing agreement allowing residents from both regions to borrow from each other’s libraries. Montcalm residents must show their Bibliothèque Montcalm library card when borrowing from a SCRL in Altona, Winkler or Morden. Library cards can be obtained free of charge from the library.